Allegorical coloured engraved portrait of 'Bernadotte', with explanation, 'Drawn & Etchd by W Heath'. Pub March 4th 1814 R Akermann Strand'. BM 13489. Landscape. On a piece of wove paper, roughly 215 x 305 mm. Good, on heavily-aged paper and with strip of blue paper mount adhering to the blank reverse. 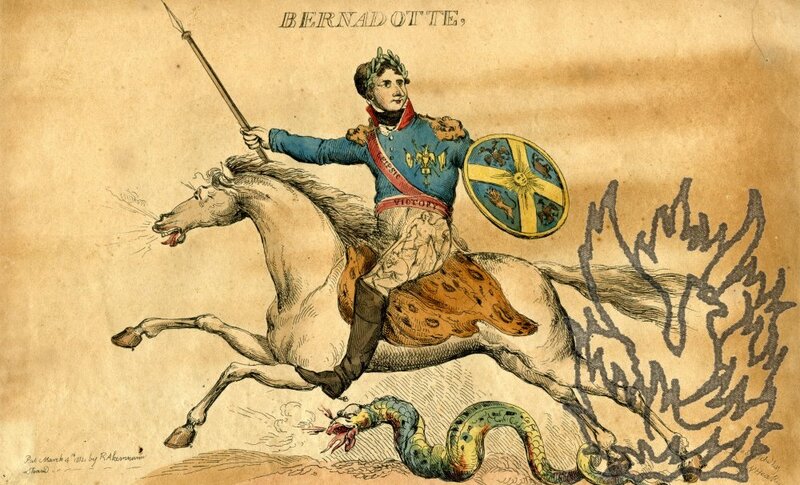 The title 'BERNADOTTE' is at the head, and the publication details and caption at the foot. 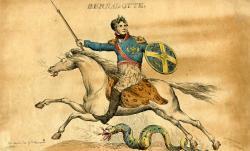 Shows Bernadotte in martial pose and uniform, riding his white horse over a fearsome serpent. He wears a sash on which are written the words 'Leipsic' and 'Victory'. The caption reads 'Round the head is a wreath of Laurel, which alludes to the brilliant Victories gain'd over the Scourge of the World, the Epaulette head of a lion the Star is formed Of the Trophies taken from the Tyrant, the Thigh is a figure of Liberty holding in Chains the Fiend Slavery, the Sheild the Swedish Cross, with the Sun Shining on the allies who are represented on the Shield, the Horse is in the act of Trampling on a Serpent alluding to the Fallen State of Buonaparte.' A companion piece to the Ackermann/Heath engraving 'BUONAPARTE', BM 12195 (offered separately), and to another portrait, of Alexander I of Russia (not in the British Museum).